The image of his face is familiar to all, imprinted on the ten-dollar bill. His career is fictionalized and popularized in a Broadway musical play, whose high-priced tickets must be bought a year in advance. Evidence of his Albany connections, especially through his wife’s family, the Schuylers, is currently on exhibit at the Albany Institute of History and Art. Television station WMHT broadcast “Hamilton and Albany” on December 4, and an important interview for that production was recorded at First Church. Who was Alexander Hamilton? Why is he important in our history ? What did he think of religion, of the church, of Christian doctrines? He was born illegitimate in the West Indies, probably in 1755, of Scottish, French, and English descent. His talents were recognized early, and patrons encouraged him to move to New York City where he attended Kings College (now Columbia). He became involved in New York’s revolutionary movement against British rule, and at the outset of the Revolutionary War, when he barely twenty years old, Hamilton was commissioned a captain to command a company of artillery. He soon became the personal secretary and aide to General George Washington, and later served with distinction at the Battle of Yorktown, in 1781. After the war’s end Hamilton studied law on his own and easily passed the oral bar exam. He entered politics as a delegate to the Continental Congress and a member of the state Assembly. Hamilton became one of the “founding fathers” of the United States and tirelessly advocated for a strong national government. He was a delegate to the convention in Philadelphia in 1787 which framed the U.S. Constitution. Pamphlets under the title “The Federalist,” authored by Hamilton, James Madison, and John Jay, persuaded a majority of the voters in the thirteen states to ratify the Constitution. As the first Secretary of the Treasury, under President George Washington, Hamilton was instrumental in stabilizing the finances of the U.S. government and establishing the nation’s first bank. He was acclaimed as a brilliant orator and debater, masterful attorney, and skillful politician, but he was self-confident almost to the point of arrogance. His biographer Ron Chernow describes Hamilton as “short and handsome, witty and debonair, and fatally attractive to women.” He made enemies as easily as he made friends. Hamilton’s long-time acquaintance, political opponent, and greatest enemy was Aaron Burr (elected Vice-President in 1800), who killed him in a duel in 1804. Hamilton’s youthful spirits were on display when, before his marriage, he described the ideal wife: “In politics, I am indifferent what side she may be of; I think I have arguments that will easily convert her to mine. As to religion, a moderate streak will satisfy me. She must believe in God and hate a saint.” Hamilton’s wife would be Elizabeth Schuyler, the daughter of Philip Schuyler, an Albany patrician who was a major-general in the Revolutionary War and later a U.S. Senator. Her pastor, Domine Eilardus Westerlo of the Albany Dutch church, married them in the Schuyler family mansion in 1780. She maintained her more than “moderate” Dutch Reformed piety through her very long life; she died aged 97 in 1854. Hamilton’s genius was darkened and troubled by his fear of social and political disorder, which men of property and standing could prevent by establishing and dominating sound institutions of government. As he wrote in one of the “Federalist” pamphlets, “Men love power.” Hamilton detested democracy, in which every man would have the vote and possibly vote for demagogues. He saw his worst fears realized in the runaway revolution in France, which temporarily destroyed and replaced the entire fabric of society. A guardian of social stability was religion, and Hamilton proposed in 1802 establishment of a nationwide “Christian Constitutional Society.” The organization would have supported both the Christian religion and the U.S. Constitution, and enable the Federalist Party, in which Hamilton was a leader, to promote its values against those of the Democratic-Republican Party headed by President Thomas Jefferson. On the eve of his own death, he wrote to “my very dear Eliza,” to say that if he did not survive he expected “to begin, as I humbly hope from redeeming grace and divine mercy, a happy immortality.” The Dutch Reformed Church on North Pearl Street was packed with mourners to hear Hamilton’s friend, the Reverend Eliphalet Nott of Albany’s Presbyterian Church, deliver an eloquent eulogy which denounced the evil of dueling. It was one of the most influential funeral sermons in American history. It helped mobilize public and political opinion against dueling, and it led eventually to passage of a law requiring every public officer in New York to taken an anti-dueling oath. 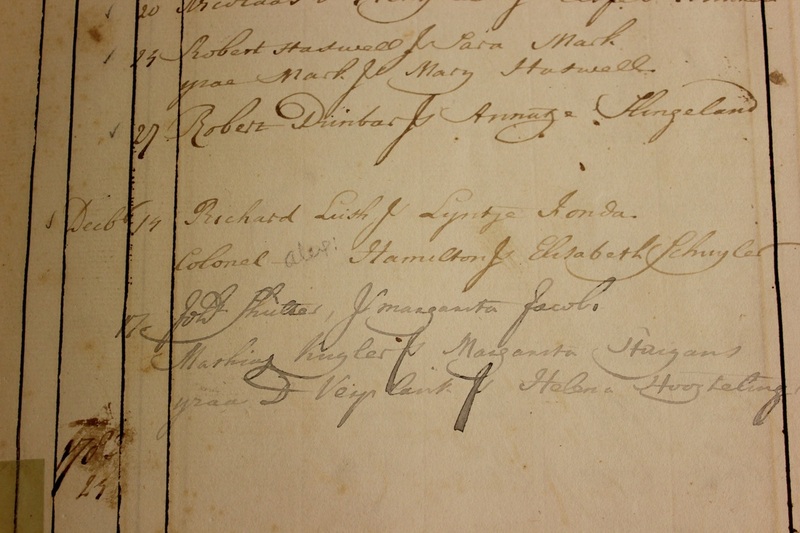 Marriage entry on December 14, 1780 for Colonel Hamilton and Elizabeth Schuyler.